The 2015 US Open was a tennis tournament played on outdoor hard courts. It was the 135th edition of the US Open, the fourth and final Grand Slam event of the year. It took place at the USTA Billie Jean King National Tennis Center. Marin Čilić was the defending champion in the men's singles event, but lost to eventual champion Novak Djokovic in the semifinals. Serena Williams was the three-time defending champion in the women's singles event and was also trying to complete the calendar Grand Slam, but she lost to Roberta Vinci in the semifinals. Flavia Pennetta won the Women's Singles title and became the first Italian to win the US Open. 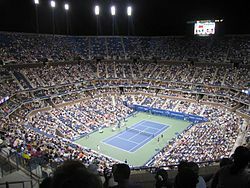 The 2015 US Open was the 135th edition of the tournament and it was held at the USTA Billie Jean King National Tennis Center in Flushing Meadows–Corona Park of Queens in New York City, New York, United States. The tournament was an event run by the International Tennis Federation (ITF) and is part of the 2015 ATP World Tour and the 2015 WTA Tour calendars under the Grand Slam category. The tournament consists of both men's and women's singles and doubles draws as well as a mixed doubles event. There are singles and doubles events for both boys and girls (players under 18), which is part of the Grade A category of tournaments, and singles, doubles and quad events for men's and women's wheelchair tennis players as part of the NEC tour under the Grand Slam category. In addition, the annual men's and women's Champions Invitational doubles events were held, with eight male and eight female former Grand Slam champions taking part. For the second year running, the American Collegiate Invitational competitions is organized, where top sixteen American collegiate players compete in men's and women's singles events. Exhibition matches also take place. The tournament is played on hard courts and takes place over a series of 17 courts with DecoTurf surface, including the three main showcourts – Arthur Ashe Stadium (with permanent steel erected and new video boards, LED court lighting and sound system in place, as part of a refurbishment project), Louis Armstrong Stadium and Grandstand. It is the last ever US Open played on courts without the operational roof on centre court and with the old Grandstand in place. Starting from the 2016 edition, the Arthur Ashe Stadium will have completed retractable roof and matches will be played on newly built Grandstand. After two years of tournament being scheduled across 15 days, the US Open returns to a traditional 14-day schedule in 2015, which has impact on all senior events. Women's singles semifinals have been scheduled for September 10 evening session, while men's singles semifinal matches will be played on Friday September 11 after mixed doubles final. Men's doubles final will be played before women's singles final on Saturday September 12, and men's singles final will follow women's doubles final. Because Serena Williams could become the first woman to win all four major tennis titles since Steffi Graf accomplished the feat in 1988 and because she could tie Graf’s major title count of 22, the women’s final sold out before the men’s final for the first time. In the United States, the 2015 US Open was the first under a new, 11-year, $825 million contract with ESPN, in which the broadcaster holds exclusive rights to the entire tournament and the US Open Series, thus ending CBS Sports' 46-year association with the tournament, and availability of coverage on broadcast television. This also made ESPN the exclusive U.S. broadcaster for three of the four tennis majors (the French Open is split between Tennis Channel for cable coverage and NBC for over-the-air coverage, with portions previously sub-licensed to ESPN until 2016). Below is a series of tables for each of the competitions showing the ranking points on offer for each event. The US Open total prize money for 2015 was increased by 10.5 percent to a record $42,253,400, which potentially could reach almost 45 million dollars, as the top three finishers in the Emirates Airline US Open Series may earn up an additional $2.625 million in bonus money at the US Open. Of the total prize money, $33,017,800 (plus $1,760,000 in qualifying competitions) is distributed for singles players, $4,927,600 for teams competing in doubles events and $500,000 for mixed doubles teams. Competitors in Legends Exhibition, Wheelchair and Champions Invitational events earn $570,000 while players' per diem is estimated at $1,478,000. Top three players in the 2015 US Open Series receive bonus prize money, depending on where they finished in the 2015 US Open, according to money schedule below. Maria Sharapova, the 2006 champion, ranked third in the world (formerly first), withdrew from the tournament due to a leg injury the day before tournament began. Making her withdrawal that was for the second time in three years. British qualifier Johanna Konta upset the 9th seeded Garbiñe Muguruza won in three sets at 7–6(7–4), 6–7(4–7), 6–2 on an epic longest match at three hours and twenty-three minutes, surpassing Nadia Petrova–Samantha Stosur match in the 2011 US Open. Eugenie Bouchard announced that she is withdrawing from the tournament citing a concussion days before her scheduled fourth round match with 43rd-ranked Roberta Vinci. She also withdrew from Women's Doubles and Mixed Doubles. Due to a withdrawal issue, Vinci advanced to her US Open quarterfinal in four years. Kevin Anderson, the 15th seed, upset the 3rd seeded Andy Murray in the fourth round on a four setter win. This was the first time since 2010 US Open that Murray failed to reach his Slam quarterfinal. Anderson became the first South African to reach a Slam quarterfinal since Wayne Ferreira at the 2003 Australian Open. In the women's quarterfinals, Kristina Mladenovic, Petra Kvitová and Simona Halep reached in their first US Open quarterfinal. For Mladenovic, it was her first Grand Slam singles quarterfinal overall six years after her first Slam debut. The women's semifinals was scheduled to be on September 10 but was cancelled due to a rain. Roberta Vinci defeated Women's No. 1 and 3-time defending champion Serena Williams in three sets. This loss ended Williams' bid to win a calendar-year Grand Slam. In the women's final, the two players were Italian: Vinci and Flavia Pennetta. This was the first time this happened in the Open Era. Seedings are based on rankings as of August 24, 2015. Rankings and points before are as of August 31, 2015. Because the tournament takes place one week later than in 2014, points defending includes results from both the 2014 US Open and tournaments from the week of 8 September 2014 (Davis Cup for the men; Hong Kong, Québec, and Tashkent for the women). 1 Rankings are as of 24 August 2015. The following players received wild cards into the main draw senior events. The qualifying competitions took place at USTA Billie Jean King National Tennis Center on 25 – 28 August 2015. The following players were accepted directly into the main tournament, but withdrew with injuries. ^ "Here's why the women's U.S. Open final sold out before the men's for the first time". Fortune. Retrieved 13 September 2015. ^ Umstead, R. Thomas (14 March 2016). "Tennis Channel Extends French Open Pay TV Rights". Multichannel News. Retrieved 16 March 2016. ^ "ESPN drops the French Open, NBCSN could step in". Awful Announcing. Retrieved 3 August 2015. ^ "ESPN to Gain Full Rights to U.S. Open in 2015". The New York Times. Retrieved 12 September 2015. ^ "2015 US Open prize money" (PDF). amazonaws.com. 20 July 2015. ^ "Bonus Challenge - Emirates Airlines US Open Series". emiratesusopenseries.com. 20 July 2015. ^ a b Rothenberg, Ben (August 30, 2015). "Maria Sharapova Withdraws From the U.S. Open". The New York Times. Retrieved January 25, 2017. ^ Briggs, Simon (September 3, 2015). "Johanna Konta beats Wimbledon finalist Garbine Muguruza in longest ever women's match at US Open". The Daily Telegraph. Retrieved September 3, 2015. ^ "Eugenie Bouchard withdraws from U.S. Open doubles". CBC per Associated Press. September 5, 2015. Retrieved January 25, 2017. ^ Dickson, Mike (September 8, 2015). "Andy Murray crashes out of fourth round of US Open as Kevin Anderson seals hard-fought victory in New York". The Daily Mail. Retrieved January 25, 2017. ^ "U.S. OPEN, DAY 8: KVITOVA, WAWRINKA, AZARENKA WIN IN FOURTH ROUND". Associated Press. September 8, 2015. Retrieved January 25, 2017. ^ "The Latest on US Open: Mladenovic reaches 1st major quarters". USA Today. Associated Press. September 6, 2015. Retrieved January 25, 2017. ^ "Thursday matches canceled by rain". ESPN. September 11, 2015. Retrieved January 25, 2017. ^ Bodo, Peter (11 September 2015). "No indication Vinci would stop Serena's Slam streak". ESPN. Retrieved 12 September 2015. ^ Rothenberg, Ben (September 11, 2015). "All-Italian Open Final Is an Unlikely First". The New York Times. Retrieved January 25, 2017. ^ "Maya Jansen and Erin Routliffe of Alabama Women's Tennis Punch Ticket to 2015 US Open". USOpen.org. 28 August 2015. Retrieved 28 August 2015.